The new Tivoli Lounge completes the Tivoli collection. A new interpretation of the mid-20th century Scandinavian design. It takes advantage of the new innovative technology to produce and bending of wooden spokes. The structure is made of solid ash wood, mat stained in various finishes and colours. Result is quiet, yet character collection which fit both public and private interiors. 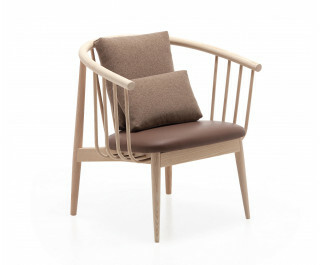 Chair, armchair and lounge are stackable. Bar stool available in bar and counter height. This collection is the fruit of long experience in interior design, of a passion for simplicity and beauty, of the desire to introduce new themes, stimuli and values to everyday life. The objects in this collection display different design approaches, yet they are all designed to meet real needs in an easy, effective way. Successful and up-and-coming designers, traditional and innovative materials, color and technology, Italian style and Scandinavian moods join together in a personal yet universal language that expresses itself in any setting: public environments, private homes, indoor spaces and in the open air. The international contract projects mean a parallel and complementary activity to l'abbate. The company dedicates its own creative and productive resources to the contract ﬁeld. The "Customization" of the current production is the method technique that makes it possible for l'abbate to reach an exceptional versatility. It is possible to realize very heterogeneous projects: from small or medium supply, to bigger ones with a personalized solution for any single unit. l'abbate is able to respond to the need for virtually any type of wood product, ranging from chairs to tables, from upholstereds to cabinets to complete hotel rooms. In the International design set l'abbate is an extraordinary experience. A collection that is not only the presentation of a series of beautiful objects, but also the portrait and representation of the best Italian production, either in wood or not. Products that are combination of art, elegance and luxury.